You know we’re hitting the Super-Bowl-news-week-before-the-week-before-the-Big-Game-doldrums when the biggest story of the day is the release of Animal Planet’s Puppy Bowl line up. Ufford over on Warming Glow has a solid breakdown of the starting pups, even if his analysis of Cocker Spaniels is completely off the mark. 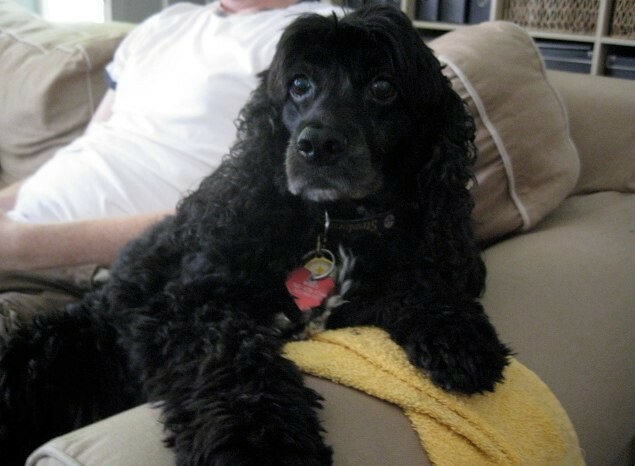 /Purposely only sends Ufford pictures of the Spaniel without her Steelers collar on. Just because it’s the Super Bowl doesn’t mean it should be all chips, wings and pizza. You’re going to need something sweet to counterbalance the savory. 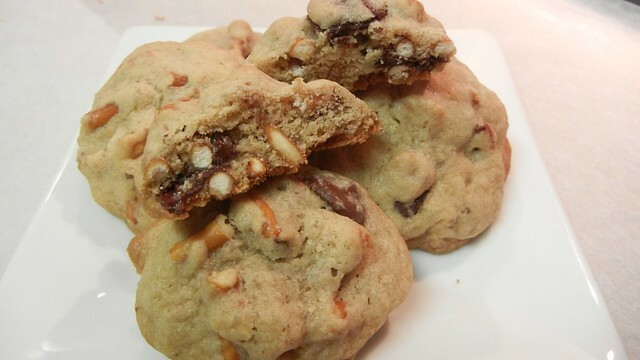 Fortunately the salt from the pretzels prevents these cookies from being overly sugary tasting and they keep their crunch nicely in during baking, matching well with the softness of the dough. Pretty much a riff on the classic Toll House recipe everyone in the world makes with just a little more vanilla. You can increase the amount of chocolate chips and peanut butter chips to your own personal preference, but I would say no more than 1 1/2 cup of chocolate chips and 1 cup peanut butter chips. 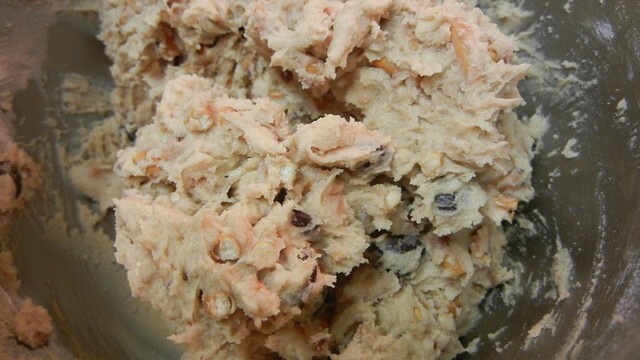 You need to leave room in the dough to hold everything all together. Me, I like my cookies not to be overstuffed (despite having three types of stuffings in this particular cookie). In a small bowl, sift the flour, salt and baking soda together and set aside. 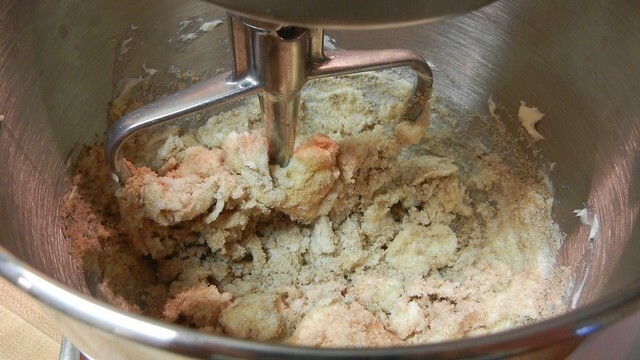 Cream together the softened butter and sugars either by hand or with a mixer. 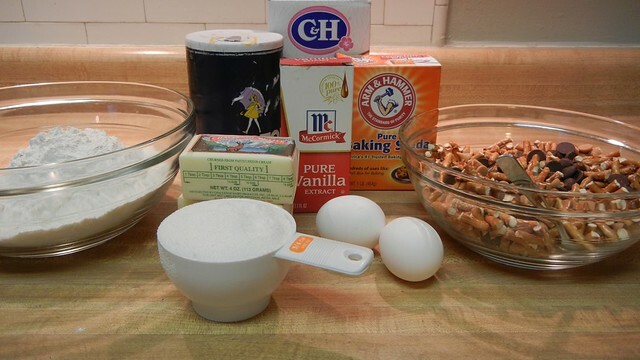 Mix in the eggs and the vanilla. 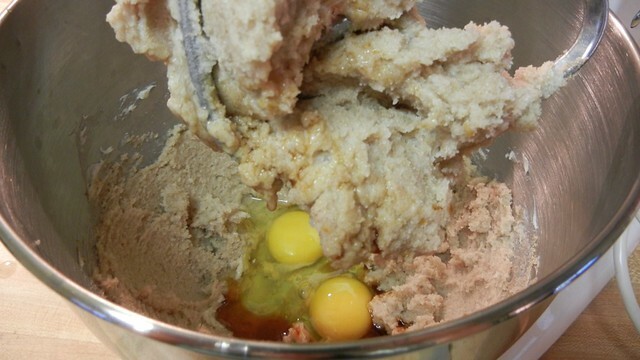 Once the eggs have been fully incorporated, slowly stir in the flour mixture until the dough is completely formed. 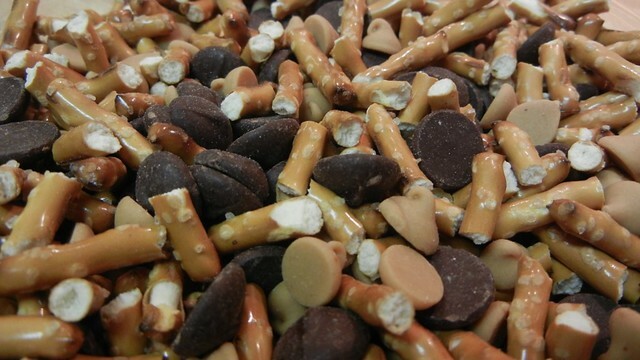 PRETZELS AND CHOCOLATE CHIPS AND PEANUT BUTTER CHIPS, OH MY! A word of advice, don’t mix in all the pretzels and chips into the dough with an electric mixer. Doing so will only crush all your pretzels down and you’ll lose all the magic of the crunch in your soft cookie. But if you’re worried about too much crunch and stabby pretzel pieces, add just half of your pretzel bits and chips into the dough, mix on the lowest speed and then fold in the rest of the sweet and salty ingredients in by hand. Or just fold them in by hand. Up to you. Bake until the edges are golden and the middle of the cookie has risen. About 10-15 minutes depending on how hot your oven runs. And serve on the Super Bowl buffet for guests to pick at throughout the game. Soft and chewy? Yes. Salty and sweet? Absolutely. Still tastes good with a dark porter or ale? From my experience, yes. Which is why it works as football food. Or you could just pour some milk over the bowl of chocolate chips, pb chips, and pretzels and eat it with a spoon. Then how to you share it with everyone? We have dramatically different priorities. It’s most certainly that too. 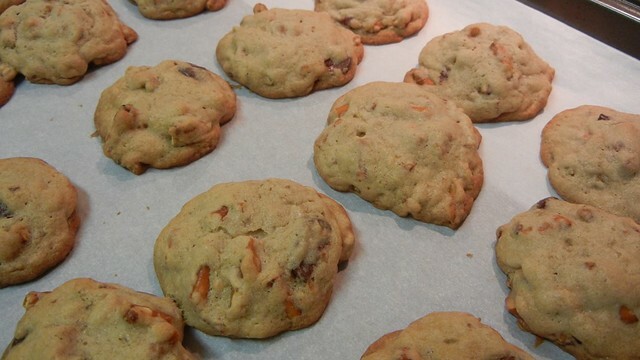 Add instant coffee granules and you’ve got a Momofuku Milk Bar compost cookie! Crackers? Tortilla chips? Oreos? They certainly know how to bring it. 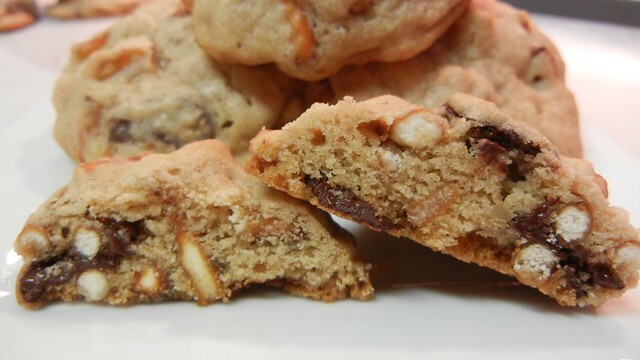 Do you know how many cookies this recipe yields? 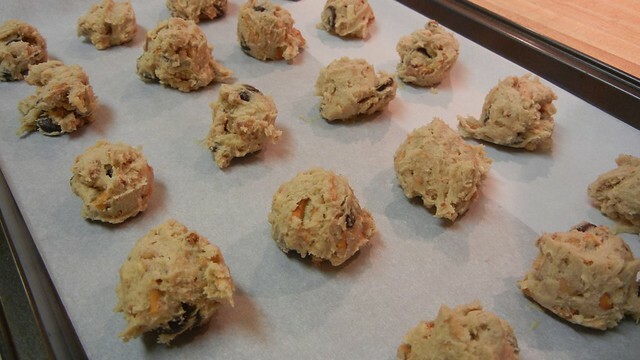 Depending on how big you make your cookies, between 3-4 dozen cookies. I just made these they turned out great! My daughter said why don’t we always make these? Glad to hear you and your daughter both liked them! Do you need to chill the dough at all before scooping/baking? I’ve been reading other recipes that suggest chilling. And other cookies look less “fluffy” than yours. I chill the dough between batches (meaning while one batch is in the oven the dough sits in the fridge for that 10-15 minutes so it doesn’t melt on the counter) but I don’t start off chilling the dough, no. I think the “fluffy” comes from baking with butter and not margarine, and that I use a cookie scoop, which makes a nice round dough ball to start with. I think the only time I completely chill any cookie dough is when I make butter crisps. No clue how I missed this last year. 1. Are those Godiva chips? 2. Did you mean those silicon “pop-back” cookie scoops? Have no scoops, but they are the leader in the clubhouse for such a purchase. No, actually I’m a fan of the Ghirardelli chips. My cookie scoop is a medium stainless steel number like this (http://www.artscraftsusa.com/Chicago-Metallic-Medium-Cookie-Scoop-Stainless-Steel_p_125451.html). It was part of the Lechter’s (RIP) Cook’s Club brand, which isn’t around anymore. What great treats for the big game! Thanks for the ideas…and the <a href="What great treats for the new year! Thanks for the ideas…and the Sugar Rush! Haha! I found your blog through a link from Molly (above) of Sugar Rush! No wonder she included your cookie in her Super Bowl collection! I can’t wait to try these. Thanks for sharing! Will they maintain the pretzel crunch if I make a day or two ahead? Yep! That’s part of the secret of not breaking the pretzels into pieces that are too small or pulverizing them. The crispy pretzel outside protects the insides. Thank you for the update; going to make them now. Hope them come out for you! Let me know.